The water is gone from Los Angeles, and from Southern California. This drought will continue, and worsen, until the city dies of thirst, and those who live in it pack their belongings and start the long journey to somewhere new, somewhere with water. 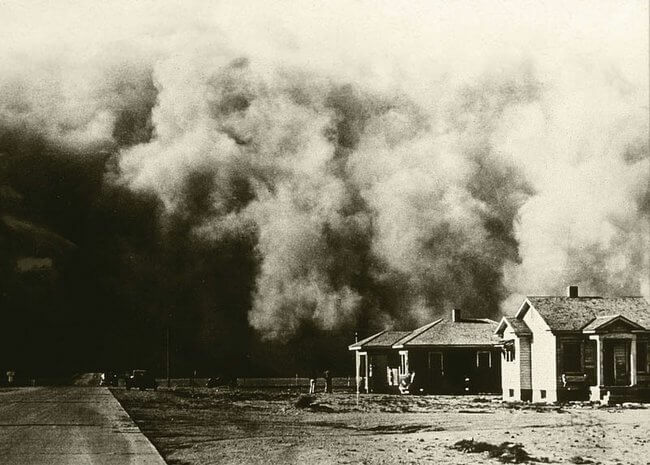 This will be known as the New Dust Bowl, and those who leave Southerm California will be called the Backoakies, because they are reversing the journey of those who fled the Midwest and the Dust Bowl of the 1930s. Just as that mass migration helped make Southern California great, the migration of so many back into the Midwest will bring greatness there. Small Midwestern cities will become engorged with new residents, and they will bring with them schemes, and money, and the sort of big dreams that are currently synonymous with Los Angeles. And so these places will thrive, becoming the birthing grounds of new art, new culture, new industry. And Southern California will become a desert once again.